We are starting to see 1440p as a quality option in YouTube for Android, as long as the video uploader has made their videos available at that resolution. Back in June, the YouTube Android app received an update that first introduced quality settings, but at the time was limited to a max setting of 720p. As June rolled on, users started to see 1080p pop-up, but this is the first time we are seeing 1440p. As you can imagine, I am only seeing the 1440p option on my LG G3, since it has a display resolution that can actually handle a video with that type of quality. 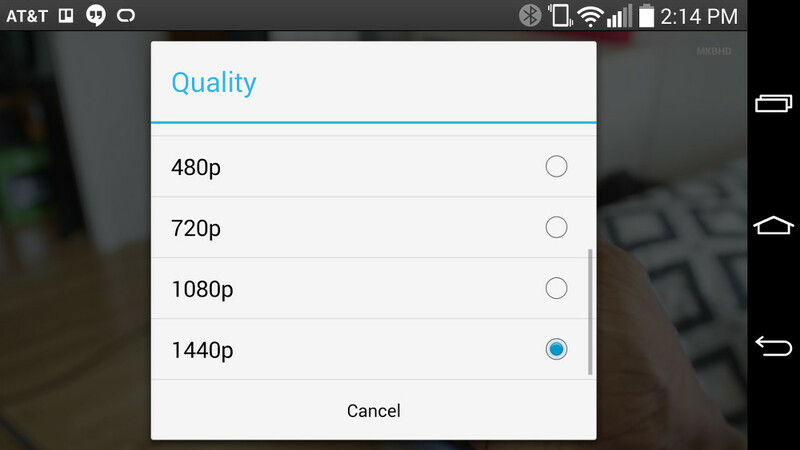 On my Nexus 5 and HTC One (M8), 1080p is the top option. To access quality settings, start playing a video, tap on it to bring up video options, tap the menu button, then the gear, and finally, choose a video resolution. If you own a phone or tablet with a high enough resolution, you should see 1440p. Cheers Greg, and @MKBHD for the video to test!